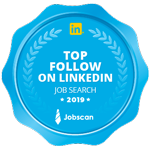 95 percent of recruiters utilize LinkedIn as a major sourcing tool to find candidates to present to their client companies seeking top-tier talent. We take a personalized approach to your LinkedIn page. Sarah will conduct a 60-minute intake call with you to discuss your personal brand advantage and positioning. Up to 4 experience sections. Experience section will be developed based on your existing resume. We will edit but we will not build your experience. This also includes a 30-minute training session with Sarah through Zoom screen share. Sarah will walk you through job search best practices and will answer specific questions.